Wei Luo didn’t recognize his face at first. But, underneath the corner of his eye, there was a small swallow-shaped birthmark. Even after many years, the birthmark hadn’t changed at all. Underneath the brightly colored lights, the sight of that birthmark crashed into her eyes and had her suddenly remembering his name. The handsome teenager’s face was gaping. Because he had been studying martial arts for many years, his facial features had become profound and determined. His skin was a healthy dark wheat color. These words were squeezed out through his teeth. He was the only one that knew the level of disgust and displeasure he felt towards her. At that time, he had almost drowned in the Imperial Palace’s lake and had also been tied to the target and shot at by Zhao Jie because of her. These two things had left a big psychological shadow on him. Even now, he still couldn’t forget how he had struggled in the water and she had been on the shore with a sweetly provoking smile that couldn’t hide the mocking in her eyes. The others had been deceived by her cute outer appearance. He was the only one that knew her cunning shadowy side! That despicable girl had grown up into a refined, budding beauty. Why was she so good-looking? Wasn’t the face a reflection of the heart? She should have an ugly appearance! This beautiful face didn’t match her inside at all. Li Song pursed his lip. As he lifted his other hand to check if she was wearing a fake face, before his hand could touch her chin, he glimpsed a fist heading towards him from his peripheral vision! He quickly ducked and looked at the side. With this movement, he stopped blocking Wei Luo. He and Wei Luo looked similar. Li Song had mistaken them for each other when they were children. Now that they had grown up, one was so beautiful that her beauty was heart stopping and the other had a peerless elegance that couldn’t be compared. Li Song couldn’t help but sigh with regret for a moment. The children born from the Wei family were truly attractive. There wasn’t anyone in the country, much less than the capital that had his and her level of appearance. Wei Luo shook her head. Li Song’s breath stopped in his throat and he almost choked himself to death. He acted improperly towards her? When did this happen? Wei Chang Hong’s eyes were like knives when he looked at him. His posture seemed as if he was trying to make up for an extreme error and would immediately step forward to beat Li Song if he dared to admit it. The capital’s influential officials’ sons would sometimes assemble together to either drink wine with courtesans in attendance or listen to ballads. So, most of them knew each other. However, Chang Hong almost never went those places. Thus, Li Song wasn’t very familiar with Chang Hong and only knew about his identity. Li Song didn’t know whether or not Chang Hong had been dedicating himself to improving his martial arts skills these past several years. So, he wouldn’t rashly start fighting at the current moment. To bring up the subject of groping, Li Song couldn’t resist think about the recent situation when the both of them had been pushed together by the crowd. The teenage girl’s body was soft and frail. With his head lowered, he had almost covered her entire body. Her body had a light fragrance. The pure and sweet fragrance smelled good. If he didn’t know her true nature, he would have really thought that she was an innocent and confused young girl and not a hateful little devil. Li Song’s thin lips were flattening into a line. He looked at the side of her face for a short period without saying anything. Song Hui would normally step forward to help smooth things over. But this time, he had the same thoughts as Chang Hong. He couldn’t bear to see anyone pollute Wei Luo. And so, he also didn’t say anything. The atmosphere was somewhat awkward. Luckily, everyone was busy watching the performances and sideshows. There weren’t many people paying attention to them, much less know their status and identity. They followed the sound to see a person standing beneath the numerous colored lanterns. The person was wearing a sapphire blue robe with a stylized flower pattern with a purple cashmere overcoat decorated with golden serpents. With his cheerful disposition, he looked as beautiful as the setting sun. He always had a smile on his face. He was sixteen years old, the same age as Li Song. But, he had an aura of nobility from birth with a sincere expression showing in his eyes. Li Song was fifth Prince Zhao Zhang’s study companion when they were children and the two of them had a good relationship. So, they didn’t have to keep thinking to correctly guess the identity of this new person. The Emerald restaurant mentioned by Zhao Zhang was located at the end of this street. A family that had a long-established reputation owned it. The storefront was decorated gorgeously elaborate and the inside was very clean and neat. It was famous for its mutton soup. This mutton soup was made by thinly slicing mutton into diaphanous pieces, then the slices would be put into an already boiling soup. After cooking it for five to seven seconds, the slices could be taken out to eat. 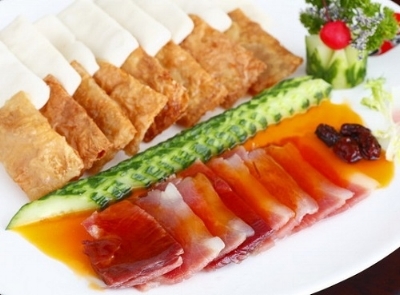 In addition to mutton, other dishes such as honey fire (T/N: cooked ham with lotus, wine, and a ton of sugar), tofu skin, and other small dishes could also be order. Emerald restaurant’s smooth and rich soup base differentiated it from other places. And its fresh and tasty side dishes weren’t oily or greasy. They went up the stairs and entered a private room. Zhao Zhang sat down at the head of the table. Li Song sat on his left and Song Hui and Chang Hong said on his right. Ah Luo and Wei Zheng sat across from Zhao Zhang. Her words implied various meanings. She intentional mentioned this in front of other people to deliberately put Wei Luo on the spot. If Wei Luo didn’t have a good reason, the other people would mistakenly think that she and Li Song had a hidden relationship. This would greatly damage an unmarried girl’s reputation.